The following content is not suitable for vegetarians. 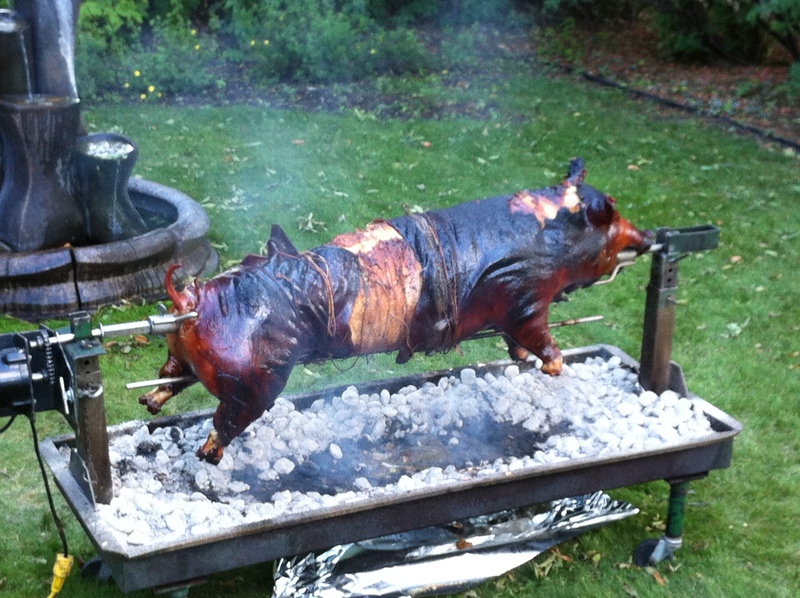 And a note for those who were wanting more detail: What happens at the pig roast, stays at the pig roast. This little piggy didn’t have a chance to squee squee squee all the way home. No siree. This piggy ended up dinner. Michael and I attended the High Street Social Club’s first annual Pig Roast and Patio Party, which was held at the Manor Bistro this Sunday past. On the menu? Pig! Not a few bucks worth of pig wrapped in cellophane on a foam tray with a moisture absorption pad like I’m used to at my local Soby’s, but a whole pig… including its head, all four legs and tiny little tail all trussed up and getting roasted. I thought I was a tough old bird when it comes to meat. I eat meat several times a week. I watched local food advocate Kevin Kossowan’s video Episode 27 – The Kill Floor. It was not easy to watch, but it was done in a respectful way and I felt it important to understand butchering and processing. So even with some hardening to the cold hard facts of being a meat eater, I have to admit I had a few seconds of “OMG that’s a whole pig and I’m going to be eating it”. And just when the thought enters my head that becoming a vegan is not all bad, a fellow diner made a comment, that to me sounded like the pig was named Rose. Found out later she meant the pig was “roasting”, but no matter, I deemed the pig’s name to be Rose after that, and for some reason, that made it okay for me to eat it for supper. When the pig came off the spit and it was time to chop him up for supper, Michael and I were hanging over the balcony railing watching the slight of hand knife work of Chef. Chef for the night was Alex Sneazwell. Michael was particularly pleased as Alex handed him a meaty rib straight from the pig. Michael claims it was the best piece of pork he ever ate. I know for a fact it also made Michael feel mighty manly to be eating a meaty rib straight from the pig (whilst in the other hand he had a very pretty looking sandinista cocktail – a mix of rum, lime, bitters and grapefruit). Then, we had the witty sharp charm of Joshua Black who was on bar ticket sale duty. We kept him busy to say the least. And those tickets had to go somewhere, and we had choice. 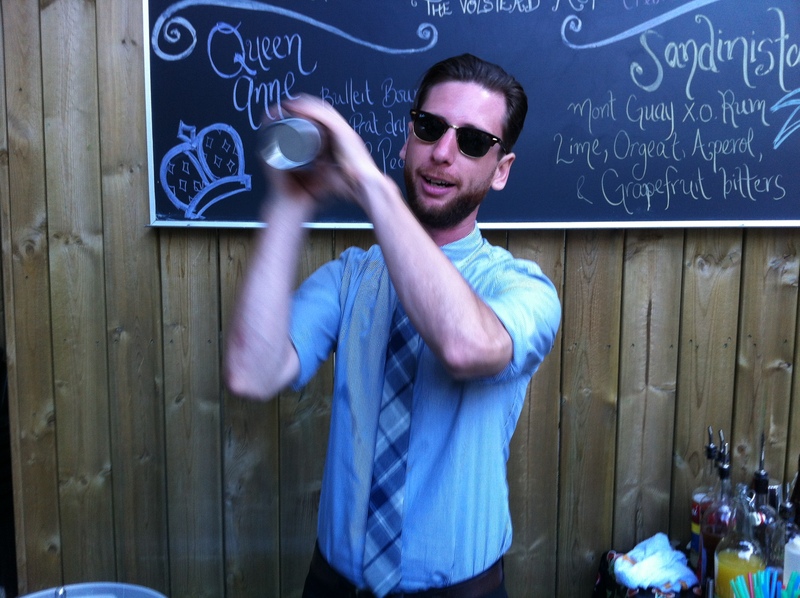 We had the highly energetic Tarquin Melnyk – Bar Director, who can make any beverage out of anything you can think of, including pork au jus. No. I’m not kidding. 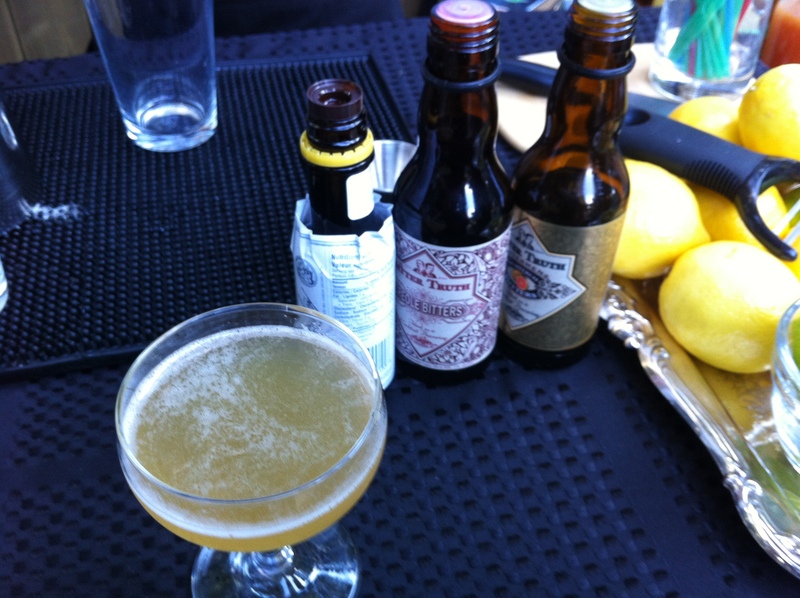 On the patio, we had the very popular Volstead Act, creating “those” sorts of alcoholic beverages that are so tasty you forget they are made with alcohol and could drink through five of them without even batting an eye – if you were so inclined that is. The rest of the evening was spent chatting over dinner, which was delicious, but as I always say, nothing makes food taste better than the company you keep. Michael and I were surrounded by Bothy bosses Doug, Eileen, Louise and Dennis, and also were privileged to have Co Koppert on my right for a most animated and entertaining dinner companion. 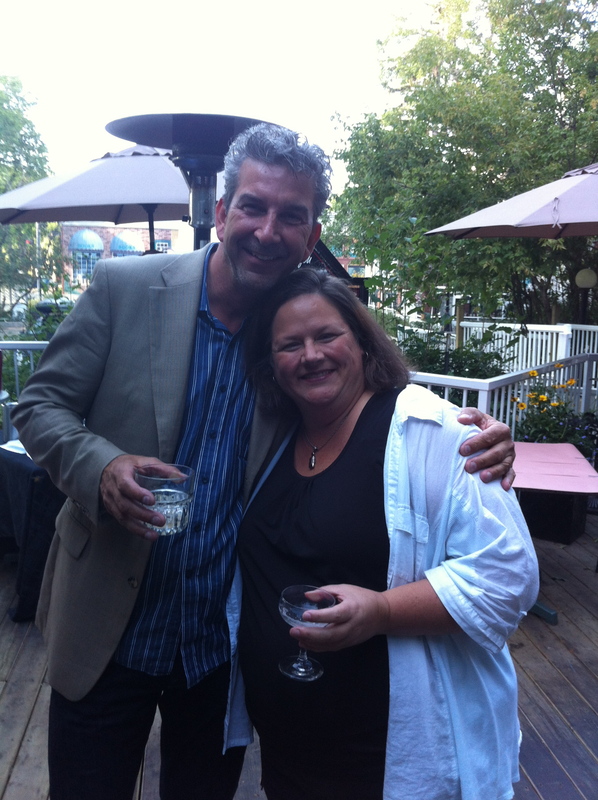 Michael and I both enjoyed ourselves at this event, meeting new friends and getting acquainted with others. It will be a night to remember for a long time. Congratulations to the High Street Social Club, The Manor Bistro, and Urban Diners Ltd. for a terrific, fun, memorable evening! I had a colonoscopy today so I kinda identify with poor Rose there on the spit. TMI? 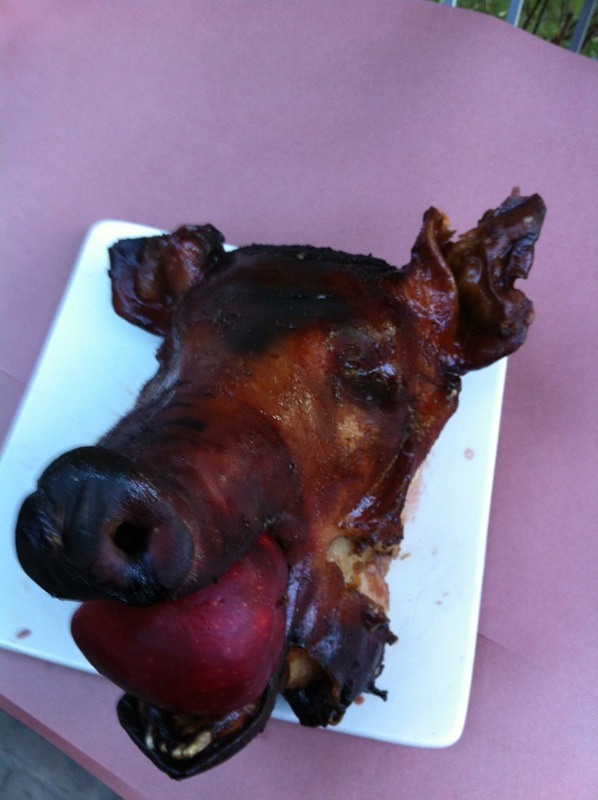 Did you get any info on why the apple-in-the-mouth thing is such an icon of spit-roasting? I’m curious if it’s functional, cosmetic or tradition. I choked on my tea reading your comment. Love it! Made me laugh. And laugh some more.